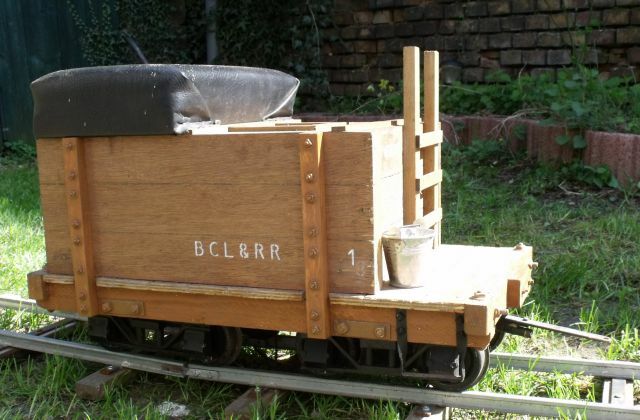 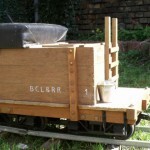 All cars of the BCL&RR are scratch-build from wood by using standard 5″-gauge wheelsets. 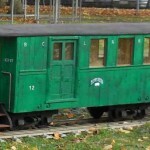 The cars are equipped with link&pin couplers. 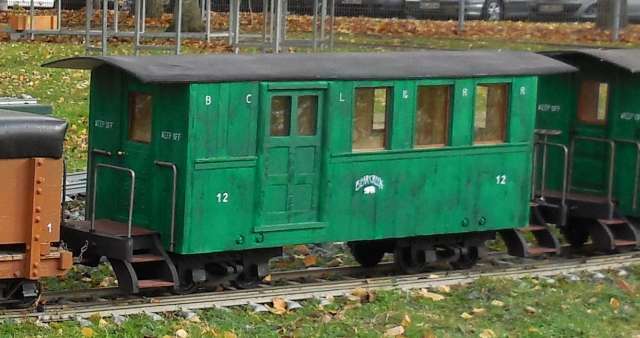 Actually, I’ve 19 cars on the roster, but to operate the 8 wheel freight cars, I need a pairs of disconnects as trucks. 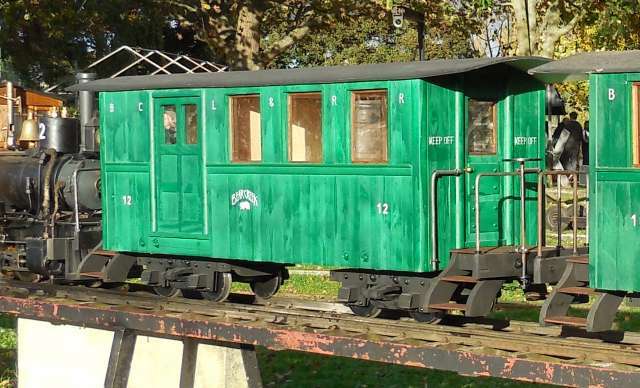 So at least, I can operate 17 cars at the same time. 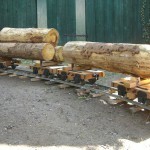 Many equipment of the logging operation is steam-powered and these steam engines will need water and fuel. 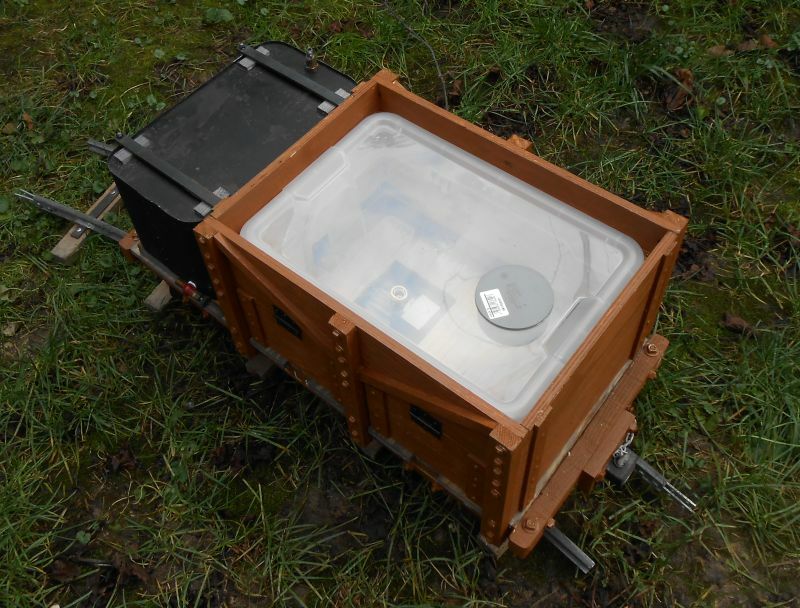 When ever possible, natural water sources were used like a lake or a creek near by. 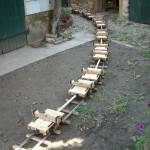 When ever this was not possible, the water was brought into place by the railroad. 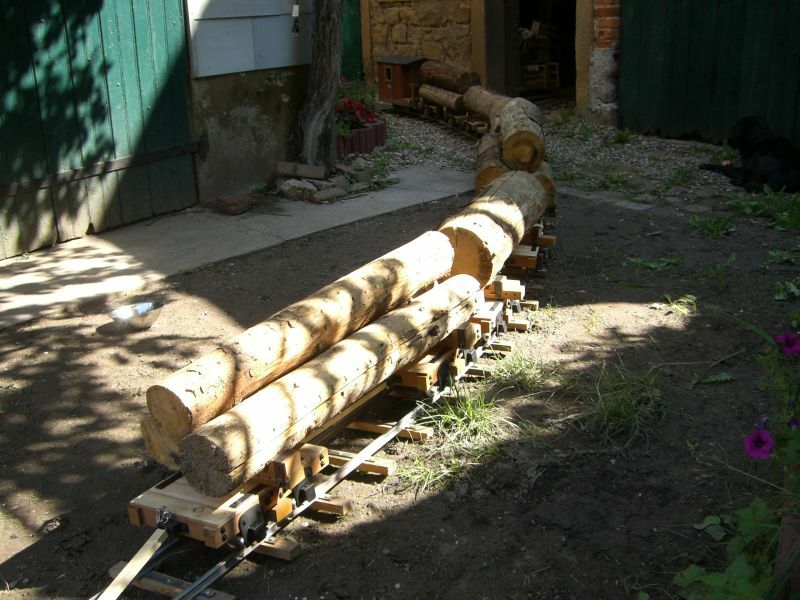 The same as with fire wood as fuel, coal for the locomotives or gasoline for generators and other equipment. 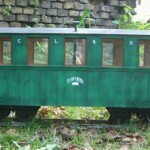 The water car #1 and fuel car #2 are used on the BCL&RR for such purpose. 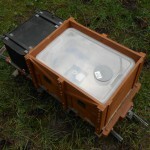 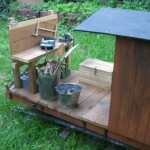 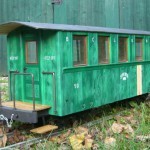 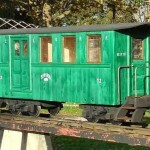 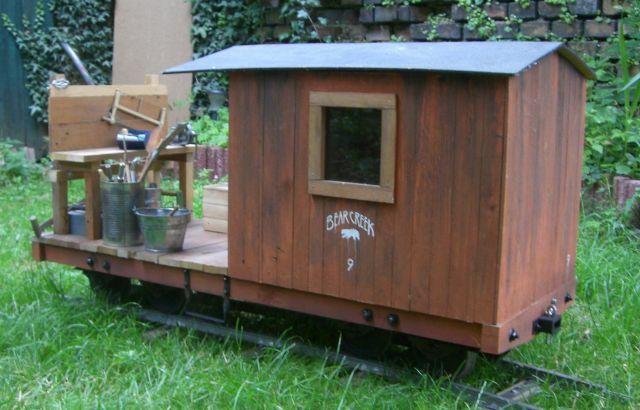 They are also designed as riding cars for the locomotives and both contain a water tank for the live steam locomotives. 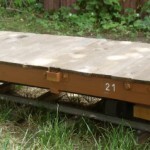 Beside logs and timber, a logging railroad also has to haul goods and freight of many kinds. 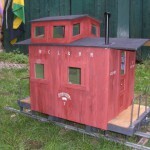 They’ll bring food and supply goods to the log camps as well as spare parts, tools, machines and other equipment. 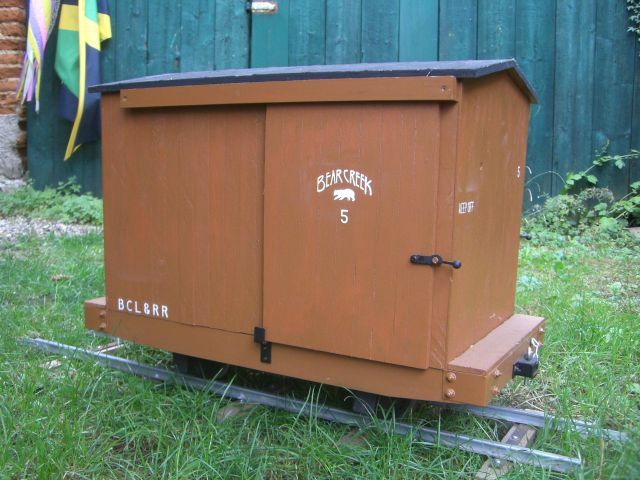 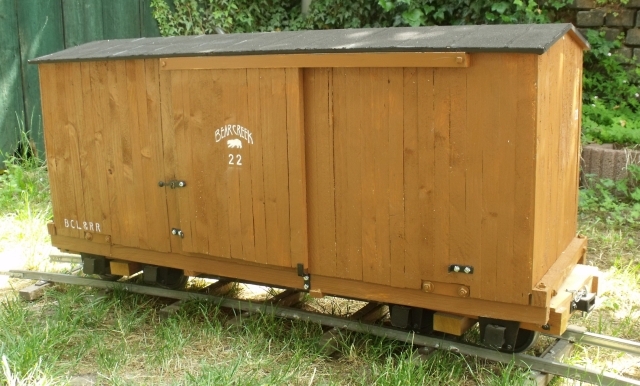 This string of simple 4-wheel freight cars were first used on the BCL&RR for freight service. 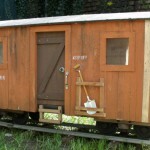 The Gondola #4 can also be used as a flat car and the box car doors can be opened. 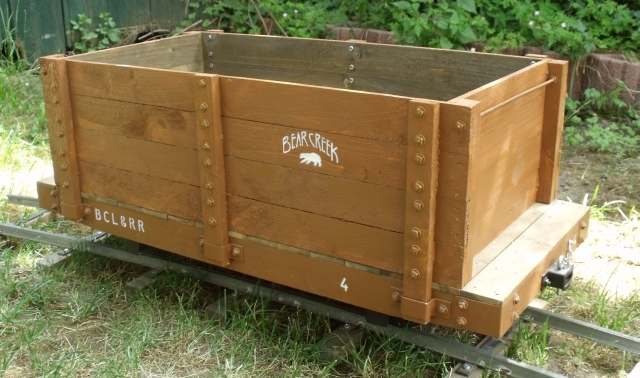 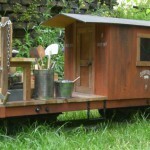 The cars are based on early Rio Grande & Southern freight cars. 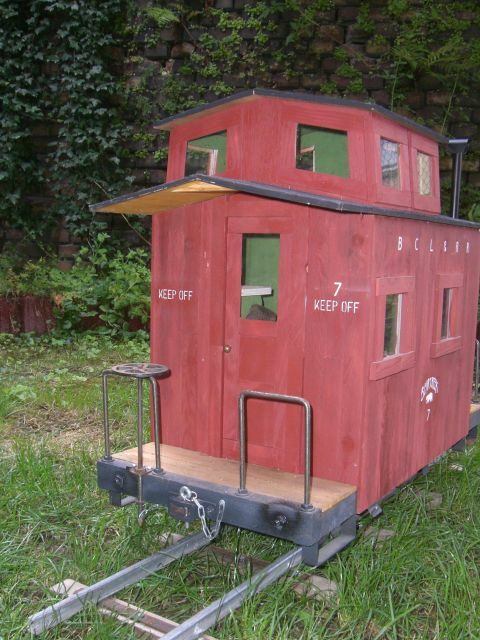 Additional to the 4-wheel freight cars above, the railroad build two large freight cars in the own car shop. 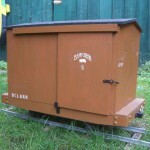 The boxcar doors will open and can be used to store real equipment and freight. 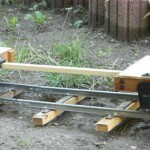 I also cut some stakes for the flat car. 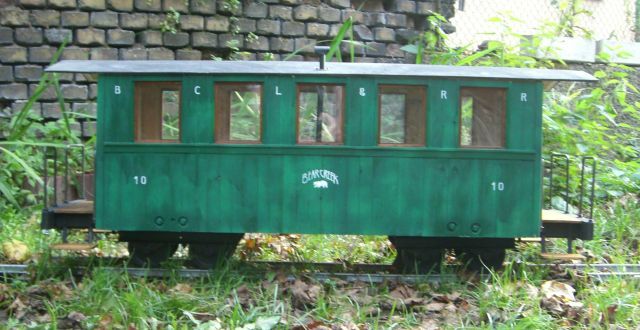 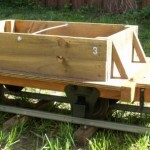 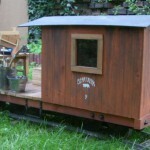 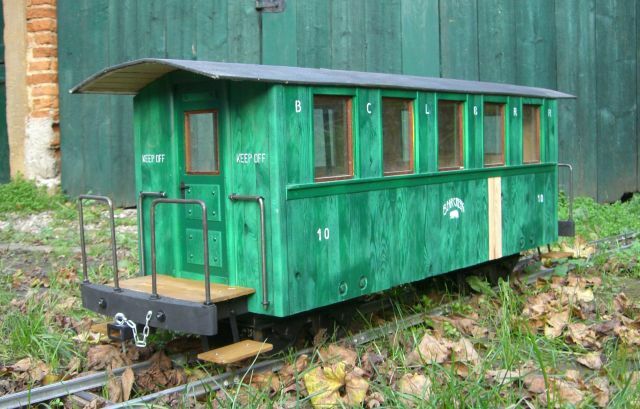 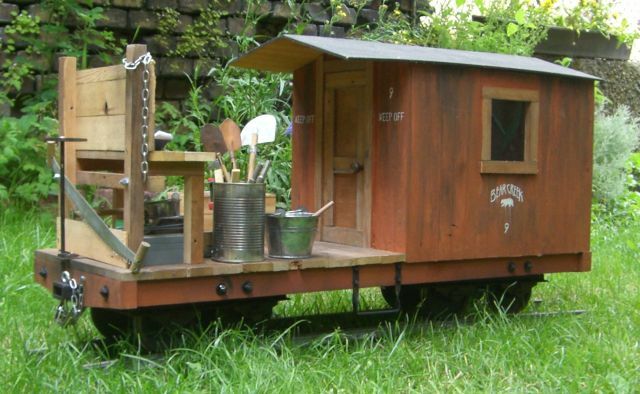 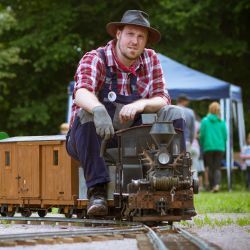 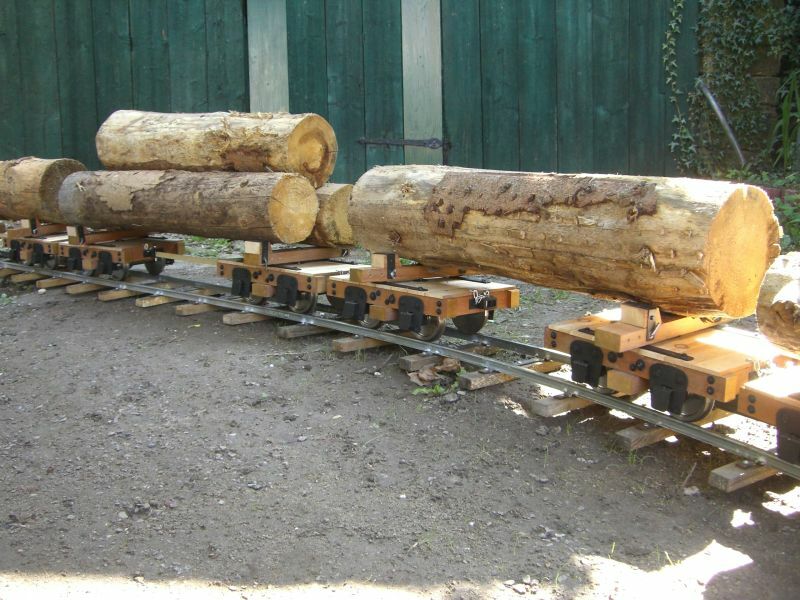 Disconnect log cars have been the most common type of log cars at early logging railroads. 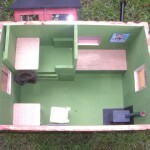 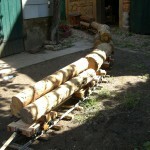 They were suitable for different length of logs and easy to build. 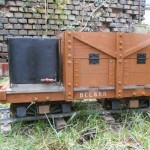 They could also be used as trucks on special cars, usual build in the own car shops. 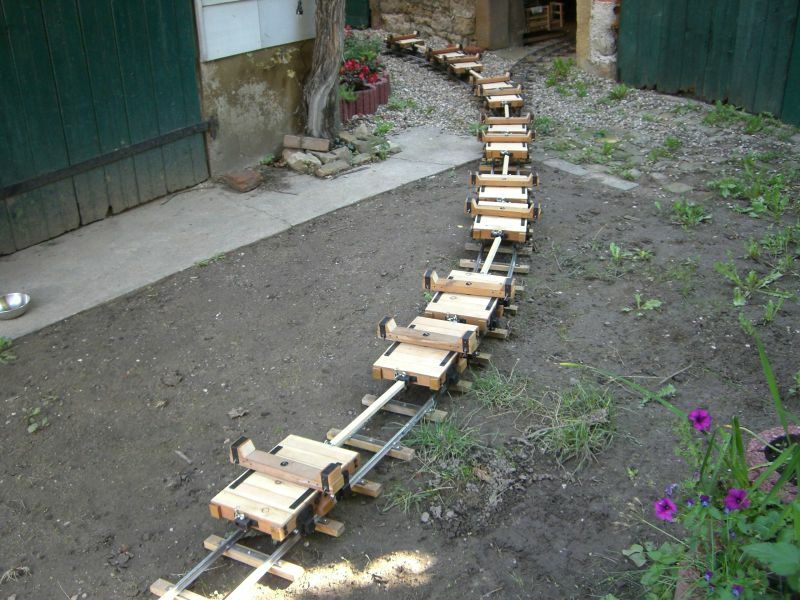 The BCL&RR owns 6 pairs of disconnects. 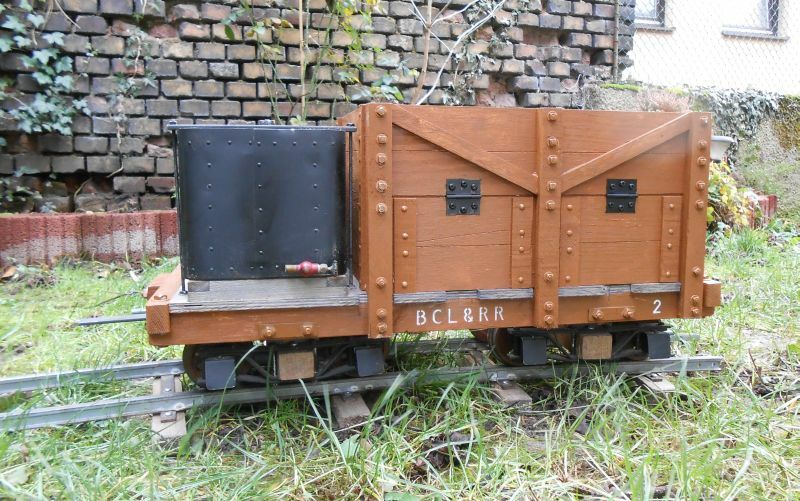 To bring loggers into the woods, or just for pure passenger service, the BCL&RR helds a coach and a combine on its roster. 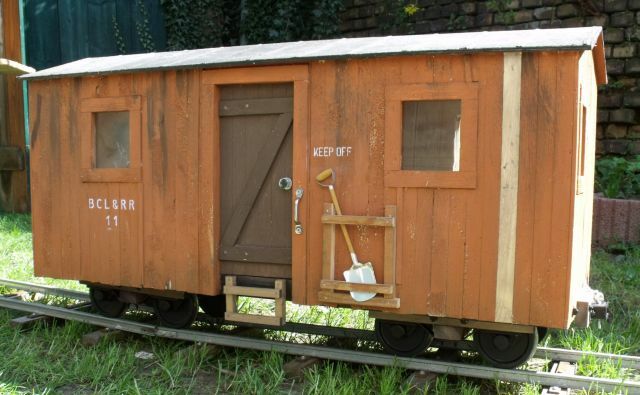 Additional there’s a crew car which is mostly used for work trains or as mobile home for temporary log camps. 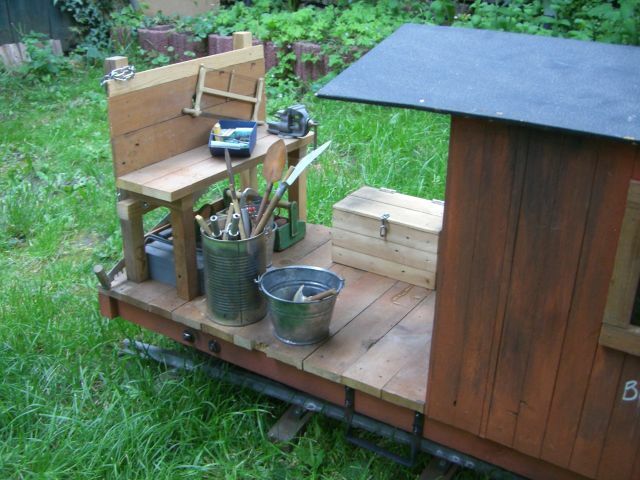 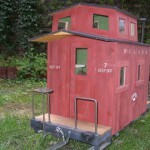 When talking about work trains, the tool car and work caboose contains nearly everything needed for track maintenance and other repair jobs on the logging railroad. 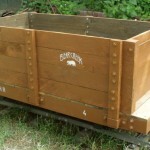 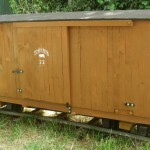 Not mandatory on log trains, but mostly seen on freight trains were the Cabeese. 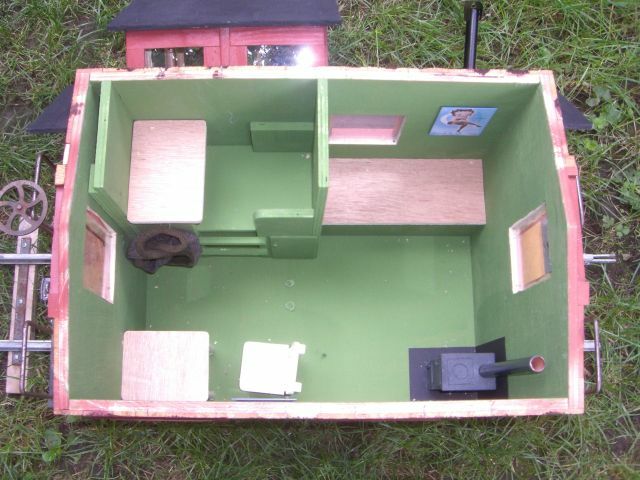 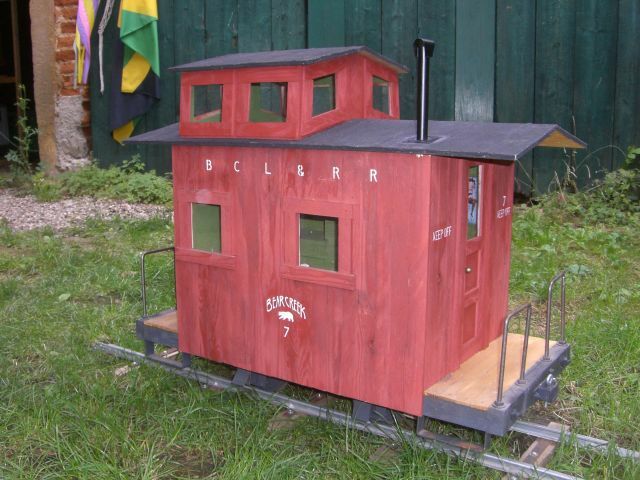 The Caboose features full interior ans is loosely based on a prototype used by the Uintah Railway.